Around 400 buffalo drowned after stampeding into the Chobe River along the border between Botswana and Namibia, possibly while running away from lions. The Chobe flows along the north-eastern border of the Chobe National Park, known for the large breeding herds of elephants, giraffe, sable and African buffalo, which make it a major tourist attraction in southern Africa. 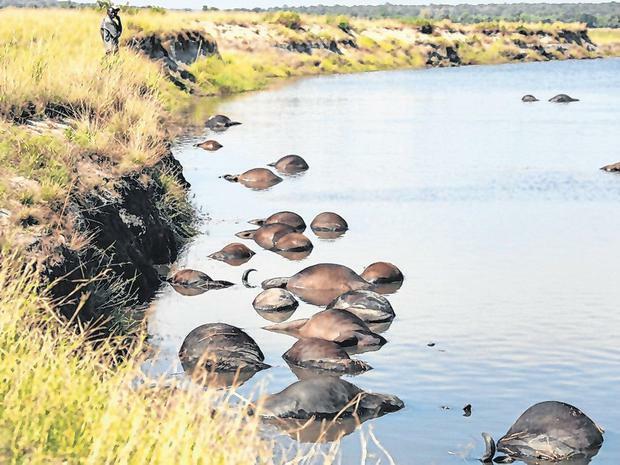 Initial investigations suggest an exceptionally large herd was grazing in Namibia before they stampeded into the river. The buffalo are believed to have trampled on each other and fallen into the river from its steep banks. "The cause of the stampede is still uncertain and under investigation. However, initial indications are that they were being chased by a pride of lions," Botswana's Ministry of Environment, Natural Resources Conservation and Tourism said. "This is not an unusual occurrence as mass drownings have occurred before in the Chobe River." A local lodge owner said it looked like the buffalo became trapped because the bank on the opposite side was too high and that they panicked and stampeded. Simone Micheletti, who owns a lodge on the Namibian side of the river, said the herd was unusually large at roughly 1,000 head. Mr Micheletti said he had heard lions roaring a lot during the night. When he went down to the river the following morning, he saw hundreds of carcasses. Most of the bodies have been taken out of the river by people living nearby in order to eat them, he said.